No other site in England presents the viewer with such grandeur and mystery, nor sparks the imagination so much as this iconic circle of stones in Wiltshire, southwest England. Writers, adventurers, historians and conquerors have all tried to answer the question, 'Who built Stonehenge? ', resulting in tales and fables of Druids, Merlin and King Arthur, ancient giants roaming the countryside, and a highly evolved prehistoric race of men. Yet the question of who, or indeed what, managed to drag several 20-ton stones more than 240 miles (386km) from North Wales across steep hills to be aligned with mathematical and astronomical precision 5,000 years ago remains unanswered. Stonehenge has recently had a huge revamp and now lures tourists with a magnificent Visitor's Centre. 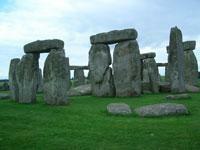 A must-see tourist sight in England, budget a full day to see Stonehenge properly. The stone circle is located just off the A303, 20 minutes' drive from Salisbury.